The annual UN Climate Change Conference (COP24) took place 2-14 December, 2018 in Katowice, Poland. 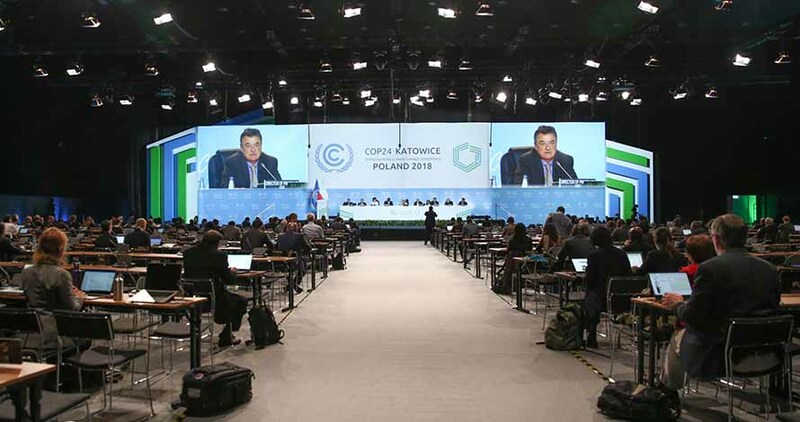 In a Press Release issued at the official opening of the conference, the UNFCCC said the goal was finalizing the implementation guidelines for the Paris Climate Change Agreement. The guidelines will provide clarity on how to implement the landmark agreement fairly and transparently for all. A summary video presentation of GEF’s submission to the stocktake on pre-2020 implementation and ambition at the COP24 can be found here. The original full GEF submission to the stocktake on pre-2020 implementation and ambition is also available. A video, Catalyzing Transformation: GEF at Climate COP24, captures some of the highlights of GEF's activities at the conference. The GEF Partnership Pavilion at COP24 hosted a series of events, briefings, launches and receptions. To help confront climate change, we need to transform the systems that support how we live, how we eat, how we move, and how we produce and consume. With a focus on delivering transformational change that will safeguard the climate and other global commons, some 30 events were co-organized with many of the GEF implementing agencies, and other partners. Gustavo Fonseca opened the 2018 Rio Conventions Pavilion, hosted by the GEF Partnership Pavilion at the COP24. Watch the video here. A wrap up video of GEF side events at COP24 is also available. Thursday 6th through Saturday 8th the GEF Partnership Pavilion hosted the Rio Pavilion. More details on events held there can be found on their website. Events listed on all other days were held at the GEF pavilion located at Zone H #2 (across from the Turkish pavilion). ​Event 1: 15:30 – 17:00 Integrated approach to urban planning: The importance of a multi-sectoral and multi-level approach. Click to see presentations on Integrated approach to urban planning and Multilevel climate action. Follow GEF on Twitter and stay up-to-date on conversations around #GEF7climate and #GEFpavilion. The GEF also organized two side events which focused on the two main components of the GEF's Climate Change portfolio: On Climate Change Mitigation and on Climate Change Adaptation. More details on the side events can be found here. At a GEF-GCF side event Coordinated Engagement to Support Countries in Implementing the Paris Agreement, Naoko Ishii, CEO and Chairperson of GEF stressed the importance of a system-based approach, and of breaking silos to fight climate change.